There is a serious mission implied in Pameran Seni Rupa Nusantara 2013 (Indonesia’s Art Exhibition 2013), with Meta-Amuk as its theme. 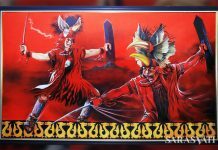 Showcasing artworks of 115 artists from 25 provinces, this bienalle exhibition in National Gallery (Galeri Nasional Indonesia/GNI) serves a vision to deconstruct the tradition of violence in the social political life of the society, especially as the 2014 General Election is around the corner. GNI hopes that this exhibition would open doors to expand the development of arts to go beyond the island of Java. Pameran Seni Rupa Nusantara 2013 titled Meta-Amuk organized in GNI from 7 to 24 May is to use arts as inspiration to the public in responding to social condition in peaceful manner. GNI seems to put forward goodwill to invites artists to put their works of art in social context while maintaining their aesthetics. 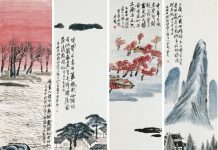 China has been successful in doing so with the masterpieces of their artists – Zeng Fanzhi, Liu Jianhua, Yue Minjun, Zhou Cunya, and Ai Wei Wei. 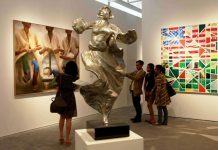 This year’s Pameran Seni Rupa Nusantara exhibits 115 works from 25 provinces, selected carefully from more than 800 artworks submitted to the committee. Quality-wise, some works show repetitions of other well-known artists and none is surprising. This exhibition is lacking unique values from the local. Meta-Amuk is chosen as theme to challenge the tradition of violence by showcasing artworks to inspire the decision makers and the public to respond social problems with peaceful manners. This theme is highly relevant as the 2014 General Election approaches. Since the beginning, Pameran Seni Rupa Nusantara is expected to promote the development of arts in other areas outside Bandung, Yogyakarta and Jakarta. The key to do so takes more than an exhibition, as it needs to be supported by developing infrastructure such as art schools and by optimizing the function of art centers in a number of provinces. Pameran Seni Rupa Nusantara aims as talent scouting beyond art institutions in the cities of Bali, Bandung, Yogyakarta and Jakarta. This is reflected on how the committee organizes and formulates themes to nurture potential talents. This year, GNI agrees on Meta-Amuk in relation with the coming 2014 General Election. Is the theme successful in inviting artists outside of the typical art cities of Indonesia? Can artists use this theme to inspire the public to respond social problems in peace?